This section reviews the different types of flooring and its chemical makeup. Laminates Formaldehyde binders, VOCs in adhesives, heavy metal contaminants in imported laminates PBT, cancer, gene damage, asthma trigger, skin and eye irritant, birth defects Buy U.S.-made products, buy with NAF (no added formaldehyde) binders or at least NAUF (no added urea formaldehyde), buy flooring that does not require adhesives for installation. Engineered wood Formaldehyde binders, isocyanates, VOCs in finishes Cancer, asthma trigger Buy pre-finished, buy with NAF (no added formaldehyde) binders or at least NAUF (no added urea formaldehyde), avoid antimicrobials. Hardwood Aluminum oxide protective layer, antimicrobials, VOCs in finishes Cancer, asthma trigger, endocrine disruption Buy pre-finished, avoid antimicrobials. Natural linoleum None None Generally is a safe product. Carpet Coal fly ash filler in backings, perfluorinated compounds (PFCs), antimicrobial additives, vinyl backings, dust trapped in carpets PBT, bacterial resistance Buy carpets without stain resistant and antimicrobial treatments, find carpet backings using ground glass instead of coal fly ash as filler, avoid vinyl backings. Laminate flooring has great versatility and is on the lowest end of the cost scale. Its clear plastic protective layer is scratch resistant and can outlast wood. Underneath lies an image covering dense fiberboard or cork. This capability makes it particularly attractive because it can mimic more expensive flooring such as hardwood. Laminate flooring uses a chemical to bind the various layers. While the majority of binders are safe, use of urea-formaldehyde in imported flooring has been in the headlines. The Consumer Product Safety Commission (CPSC) tested formaldehyde in laminate flooring samples manufactured in China during 2012-2014 that were sold at Lumber Liquidators stores. They found that the Chinese-made laminate flooring increased formaldehyde amounts in indoor air by six times the normal limit, causing health problems for residents. Health issues include breathing problems and short-term eye, nose, or throat irritation while long-term exposure has been linked to cancer. Urea-formaldehyde also can severely affect gastrointestinal, immunological, reproductive, respiratory, and the skin and sense organ systems. People with pre-existing conditions such as asthma are especially at risk, even with low levels of formaldehyde. Engineered wood flooring uses a thin veneer of real wood or bamboo glued over structural plywood or other composite wood for a lower cost than hardwood. Engineered wood has similar health concerns as laminate flooring. Since both products are comprised of composite wood, resins are used bind the layers together. Common resins include formaldehyde and isocyanates. Health impacts of formaldehyde-based resins are discussed above under laminate flooring. Isocyanate-based resins are dangers also found in spray polyurethane foam insulation. The same isocyanates, MDI (methylene diphenyl diisocyanate) and TDI (toluene diisocyanate), are used in engineered wood. These are listed as chemicals of concern by the Environmental Protection Agency and are known to cause asthma, lung damage, skin irritation, harm to the immune system, and chemical sensitivity. Engineered wood flooring uses the same finishes as hardwood flooring, thus the VOC health impacts remain problematic. Pre-finished flooring and water-based finishes are ways to lower the VOC off-gassing in your home. Wood flooring is the most popular choice for homes across America. It is aesthetically pleasing and offers impressive wear resistance. But it tends to be expensive. 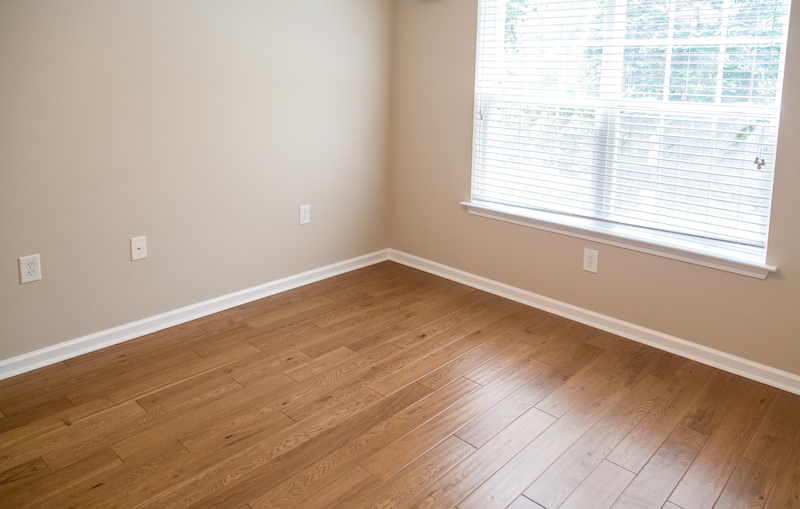 True hardwood floor is comprised of solid planks of wood that can be sold either unfinished or prefinished. Wood can be freshly harvested or be reclaimed, typically from an older building. 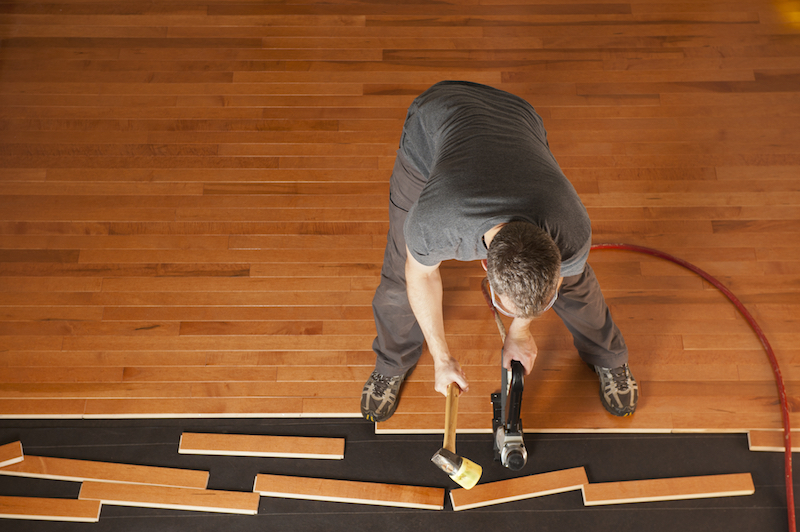 The finishing treatment determines the potential hazards of hardwood flooring. Acrylics and polyurethanes are popular finishes. Some include aluminum oxide as a protective layer which can be released when floors are sanded. Once it is inhaled, aluminum oxide can cause respiratory problems and damage internal organs. Oil-based finishes also are associated with high levels of volatile organic compounds (VOCs), which off-gas into the air and cause health problems such as cancer and damage to the liver, kidney, and central nervous system. Water-based finishes have lower VOC content. There also is a concern about anti-fungal chemicals used to treat wood. Biocides called anti-sapstain treatments are used in unfinished, prefinished, and engineered wood to protect against fungus that can stain the wood. Studies have found these preservatives can cause reproductive and developmental damage and even lead to cancer. Vinyl is a man-made plastic flooring common in residential housing. Vinyl tends to be cheaper than wood or ceramic though certain luxury vinyl is more costly. The two most common types of vinyl flooring are vinyl composite tile (VCT) and vinyl sheet flooring. 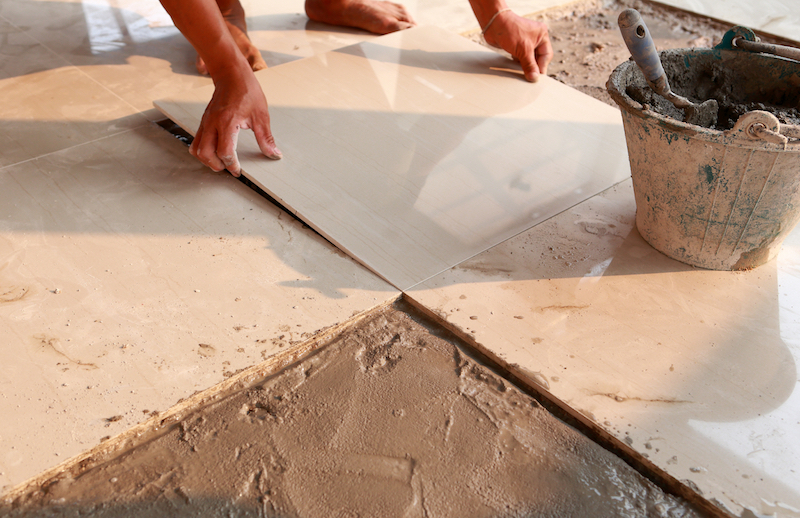 VCT is mostly a limestone, clay, and talc mixture (up to 80% of the product) mixed with polyvinyl chloride (PVC) resins, plasticizers, stabilizers, and pigment that is then cut into tiles. Vinyl sheet flooring is primarily made up of PVC resins, plasticizers, and stabilizers which create vinyl foam that is spread onto a sturdy backing. Phthalate plasticizers. They make the flooring soft and yielding. However, studies have linked phthalates to reproductive, developmental, and respiratory problems. Additionally, some phthalates are known carcinogens and have been identified as asthma triggers. Phthalates migrate from PVC products into the environment. A 2015 study by the Ecology Center of vinyl flooring from major American retailers found that 58% of the flooring contained phthalates. Organotin stabilizers. 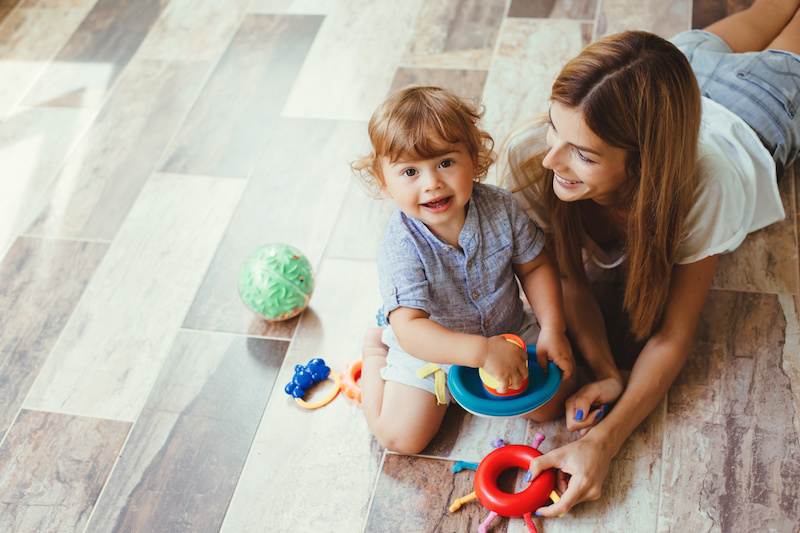 The 2015 study found 89% of flooring contained organotin (a tin-based compound) stabilizers, which are known persistent bioaccumulative toxic (PBT) chemicals that are endocrine disruptors. Heavy metal stabilizers. Other stabilizers rely on heavy metals such as mercury, lead, and cadmium. These tend to be in imported products. Metal toxicity can result in reduced mental and central nervous function, lower energy levels, and damage to blood, lungs, kidneys, liver, and other organs. Halogenated flame retardants. To reduce fire risk, manufacturers treat vinyl flooring with halogenated flame retardants. These chemicals have been linked to liver toxicity, thyroid toxicity, developmental and reproductive toxicity, and developmental neurotoxicity. They too are PBT chemicals,a class rated as a “very high concern”— the highest level. Ceramic offers a natural looking, long wearing floor covering but can be pricey due to installation costs. It is often found in parts of the home that have susceptibility to water damage, such as bathrooms or laundry rooms. Ceramic tile is primarily made from natural materials like clay and is relatively safe when made without toxic glazes. Tiles made in the United States do not use lead compounds in their glazes. However, when products do not specify the manufacturer’s location, it is safest to assume that dangerous heavy metal compounds are present. Some ceramic tiling will use antimicrobials in glazes to kill or inhibit the growth of microbes. Triclosan, a common example of antimicrobials used on ceramic tile, is associated with hormone disruption, developmental and reproductive effects, allergen sensitivity, and antibiotic resistance. Other antimicrobials used are silver zinc zeolites and nano-silver particles which can cause developmental and reproductive harm. These chemicals can be absorbed through the skin or ingested via contaminated dust. 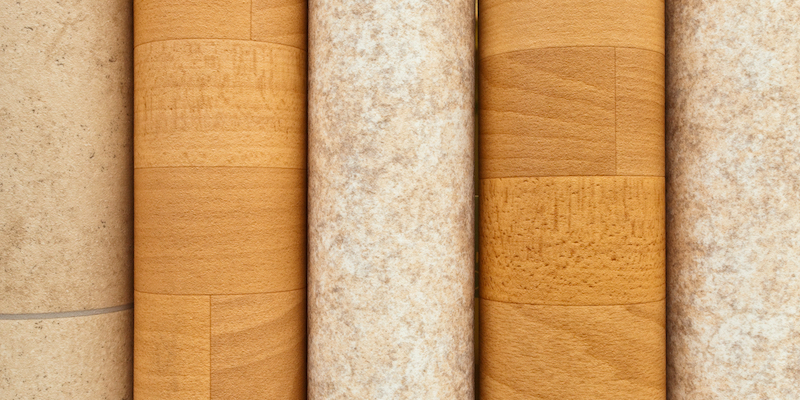 Linoleum is made from a mixture of natural components such as linseed oil, tree resin, wood and cork flours, limestone, and pigments which is then pressed onto a backing material. Similar to vinyl, linoleum can come in sheet or tile form. Linoleum flooring is ranked as one of the safest, healthiest options for homes by the Healthy Building Network. Be sure to ask for natural linoleum. In the past linoleum was sometimes used a term for vinyl flooring. Carpet offers a variety of textures and patterns while also providing a level of comfort that most other flooring does not. Carpet fibers are typically made from wool or synthetics such as nylon, acrylic, polyester, or polypropylene olefin. The fibers are attached to a carpet backing and various surface treatments are applied. 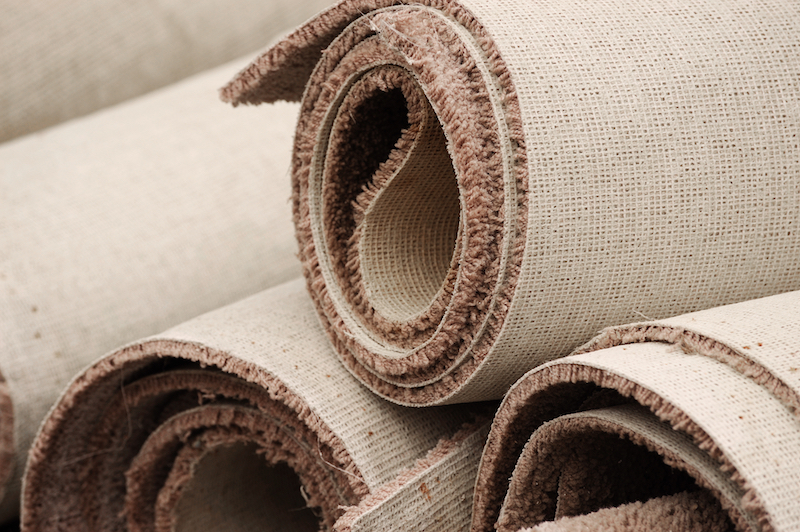 While materials used for carpeting can vary, certain health hazards remain consistent. Carpet backing typically is composed of styrene butadiene resin (SBR) latex. Other forms include vinyl and polyurethane. All three of these backings contain known carcinogens and toxins. SBR latex carpet backing contains the carcinogens styrene and butadiene, both developmental toxins. Vinyl backings use carcinogens such as vinyl acetate while polyurethane backings use methylenedioxyamphetamine, or MDA, a known potent carcinogen that is being phased out by the European Union. Often found as filler in recycled carpet backings, coal fly ash can be contaminated with mercury and other heavy metals. Mercury is a persistent bioaccumulative toxic chemical that damages developmental and reproductive systems. Carpet backing is often treated with halogenated flame retardants. See the vinyl flooring section for more on flame retardants and their associated health risks. The popular stain repellant features found in carpeting are another major concern. The coatings use highly fluorinated chemicals that are linked with health concerns such as cancer, elevated cholesterol, decreased fertility and thyroid disease. Carpets also may add antimicrobials, which show little effectiveness in preventing disease but which quickly migrate off the carpet. They are associated with hormone disruption, developmental and reproductive effects, allergen sensitivity, and antibiotic resistance. Finally, carpet can accumulate a lot of dirt, dust (where many chemical compounds end up), and pet dander, all of which can trigger asthma. Use of carpet should be carefully considered.